One of the leading online casino games developing platforms, Pragmatic Play, has announced the launch of the latest addition to the company’s extensive offering of video slots. The new game has already been called “a game changer” and a creative work of art and a masterful recreation of an era long gone. Titled Ancient Egypt Classic, it’s pretty obvious where does the game draw its inspiration from. Featuring a 5-reel 3-row layout with 10 paylines, this fresh release offers stunning 3D visuals, with top-notch animations and an exciting playing experience. Developers at Pragmatic Play gave their best to create a game that would offer a combination of unique elements and a distinctive gaming experience, while the list of its functionalities includes Autoplay option, as well as turbo spins. The reels are populated with symbols that match the whole theme, so expect to encounter the Eye of Horus, Anubis, the Ankh, Cleopatra, the Golden scarab beetle, as well as the usual set of playing card icons. The symbol represented by the Scarab beetle is the game’s Wild, substitutes for all other icons, bar the Scatter, and helps player form additional winning combinations and grab more cash. Landing a minimum of three Scatters on the reels will trigger the game’s bonus feature, awarding players 10 free spins. Punters will also benefit from a feature that will see a randomly chosen symbol expand across the reel to form huge wins. This can happen during both the Main Game and the Free Spins round. The entertaining bonus feature brings a wide variety of fun-filled symbols, while players can expect a lavish array of winning combinations. 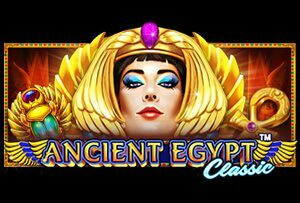 Ancient Egypt Classic has already gone live, and you can find it and play it at any online casino powered by Pragmatic Play. Pragmatic Play boasts an impressive portfolio of video slots, which includes more than 100 HTML5 games, developed with a mobile-first mindset, and offering an excellent user experience on both desktop and mobile. The list of the company’s titles includes the world-famous Da Vinci’s Treasure and Wolf Gold.